Decorating the X-mas tree was never as much fun as this! 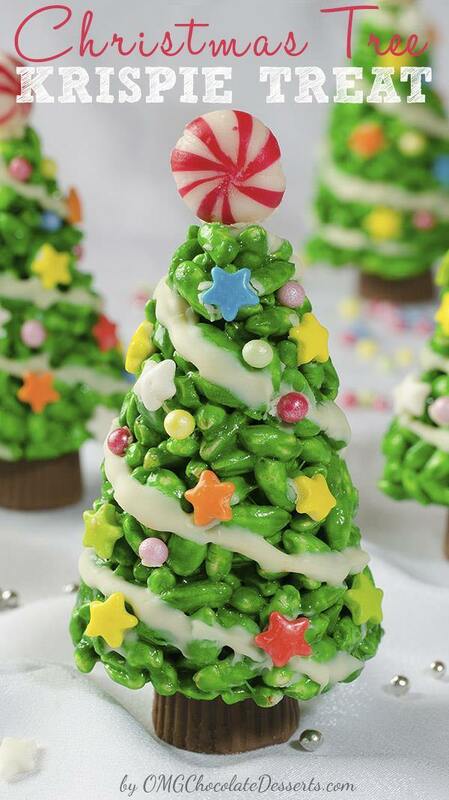 These sweet little Chritstmas trees are a quick and a very simple treat and you and your children will enjoy making it! Melted marshmallow, a little color, rice krispie cereals, chocolate decorations, candy and the Christmas trees are ready for the holidays! I know, it’s not yet Thanksgiving and I have the Christmas trees ready. It surely looks a little crazy, but that is one of the advantages of the food blogger. If you are like a child jumping around waiting for Christmas to come, you have the perfect excuse to enjoy the Christmas magic even one month earlier. But still, I want to share the recipes with you, my dear and avid readers, just in time. Ok, enough, it’s time to be frank and stop hiding behind my son and the role of „food blogger“. I’m the one who is worse than a five year old child waiting for the festivities. As soon as the first decorations lit up the shops, I began buying them in secret and began planning the Christmas celebration this year. These sweet little Christmas trees I have in mind since I saw those adorable Rice Crispie Pumpkins this autumn. That sweet mix of marshmallow and Rice Crispies is like play dough, perfect for making whatever you wish of it. With the help of the foam which comes in a waffle cone pack to protect the cones, the trees are easily shaped. After that, you melt the white chocolate and pipe it like a garland around each tree, and the rest you use as glue to hang the candy and pearls as decorations on the tree. And yes, there are the Mini Reese’s Cups which are glued as the trunk of the tree, and instead of the star, you put the peppermint candy on top. Your trees are now ready and you can wait in piece for Santa to come through your chimney and leave the present you wanted for years. Cut the foam that comes in a waffle cone pack to protect the cones, it will make much easier to shape the trees. In a large saucepan melt the butter over low heat, then add marshmallows and stir until completely melted. Stir in green food coloring to make mixture dark green. Remove from heat and stir in Rice Krispies cereal (stir well until all cereal is well coated). Grease your hands and form mixture into cone shapes, place trees onto prepared pan and set aside for several hours to firm up well. Melt white chocolate and transfer to piping bag or zip-lock bag to pipe onto trees. Pipe melted white chocolate like a garland around each tree. Place edible pearls, star candies (you can use mini M&M candies, or whatever you have on hand) like ornaments onto the tree using a dots of chocolate as a glue. Pipe chocolate on top of tree to attach peppermint candy. Place a Reese’s upside down on pan and pipe chocolate on it and place tree on top. How long do these typically last for?? Hi Yvonne, they last for no more than two days at room temperature in airtight container, but in airtight container in the fridge you can keep them longer or freeze for up to 6 weeks. What if you don’t have one of those waffle cone foam thing you said? Hi Chanda, you could roll it with you hands just grease them well before you start modeling the tree, or make a cone from a carboard overlayed with parchment paper. How do you do the piping? Hi Jen, You can transfer melted chocolate into ziploc bag, cut the corner off and pipe the chocolate around the tree. Hi Amie, keep them in the fridge in air-tight container. Your trees look like you used puffed rice, not rice krispies.